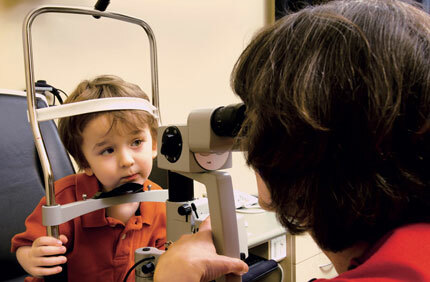 Children need to see the optometrist every year starting at six months of age. That's because children are at risk of a number of vision and eye health problems that can cause lasting damage if not caught and treated early. Vision problems can also negatively impact child development and grow into adult problems (like poor educational and vocational achievement, social problems and increased rates of incarceration). I have a thriving pediatric optometry practice in Vancouver, BC. Parents bring their kids in from all over Metro Vancouver and Surrey mostly because of word-of-mouth referrals. But what about my children's optometry practice gets parents talking and recommending me to other parents? Here are some of the things that I think an optometry clinic must have to provide excellent eye health care for children. Nothing beats an eye doctor that loves kids and has children of his or her own. Not only do I have two very young children, but I love kids and have always devoted a significant part of my life to children. A kid- friendly personality comes through when you meet an optometrist. You can do a personality test on a prospective optometrist by having an eye exam before you bring in your kids to get a sense of what the doctor is like. Are they warm, friendly and energetic? Kids love that. Or are they cold, distant, excessively analytical. Kids are likely to be unimpressed with that. If a doctor can engage a kid's attention, the visit is bound to be fun, informative and, most importantly, medically useful. As an example of this factor, in optometry school, one of my projects was to develop a children's book tittled Iris Goes to the Optometrist that parents could use to teach and prepare their kids for going to the optometrist. You can find it on Google Books, just click here. Optometrists that are the best with children have things like this in their professional or educational experience that show their love, concern for and interest in children. Ask if the optometrist is a member of the College of Optometrists in Vision Development or visit http://www.covd.org/ to search for their name. So many children's vision problems are developmental in nature and some optometrists who are focused on an adult population may not test for disorders like binocular dysfunction, convergence insufficiency, amblyopia, visual information processing. These disorders can make if very difficult for kids to success in school and may affect their self esteem and other aspects of their lives. An optometrist that is alive to these disorders and has a vision therapy practice (like I do) to treat them can make a huge difference in a child's life. Sometimes when these visual disorders go undetected, children may be misdiagnosed with attention deficit hyperactivity disorder, or ADHD, because the symptoms of the vision disorders are similar to ADHD symptoms. Children should not be medicated for a condition that they don't have and you can avoid that risk by finding an appropriate children's optometrist. Does the clinic have a children's play area? One of the things parents love about our new Vancouver clinic space is that we've devoted a good chunk of space for a children's play area, packed with toys and books. I know that cranky kids, bored in a waiting room, are a challenge to deal with because I deal with it when I take my kids to the doctor. I put in my clinic what I wish my dentist and GP would put in their clinic. Choose an optometrist that has done the same. Does the clinic have a good selection of frames and eye-wear for children? If a child needs glasses, its nice to be at a clinic that caters to that need. At our Vision Source Vancouver optometry clinic, we have a very good selection of kids frames and eye-wear and I'm always surprised by the reaction of parents. They are not used to having so much to choose from. Kids are often neglected by optical dispensaries. Choose an optometrist that has a good selection of kids frames. Parents are busy enough. It's very nice if you can reduce your running around and get what you need at one place.